In a briefing today on solar eclipse science, leading U.S. scientists highlighted research projects that will take place across the country during the upcoming August 21 solar eclipse. The research will advance our knowledge of the sun’s complex and mysterious magnetic field and its effects on Earth’s atmosphere and land. Experts at the National Science Foundation (NSF), the National Aeronautics and Space Administration (NASA) and the National Center for Atmospheric Research (NCAR) discussed how scientists from coast to coast are preparing to deploy an array of technologies and methodologies to gain unprecedented views of the sun. The experiments, led by specialized researchers, will also draw on observations by amateur sky watchers and students. The scientific experiments will take place along the path of totality, a 70-mile-wide ribbon where the moon will completely cover the sun; it stretches from Oregon to South Carolina. Viewers in any one location may experience the total eclipse for as long as two minutes and 40 seconds. It will take about an hour and a half for the eclipse to travel across the sky from the Pacific Coast to the Atlantic. For scientists, the celestial event is a rare opportunity to observe the elusive solar corona, the sun’s outer atmosphere, which is usually obscured by the sun’s bright surface. Many scientific questions focus on the corona: Why is it much hotter than the sun’s surface? What role does it play in spewing large streams of charged particles, known as coronal mass ejections, which strike Earth’s atmosphere and can disrupt GPS systems and other sensitive technologies? 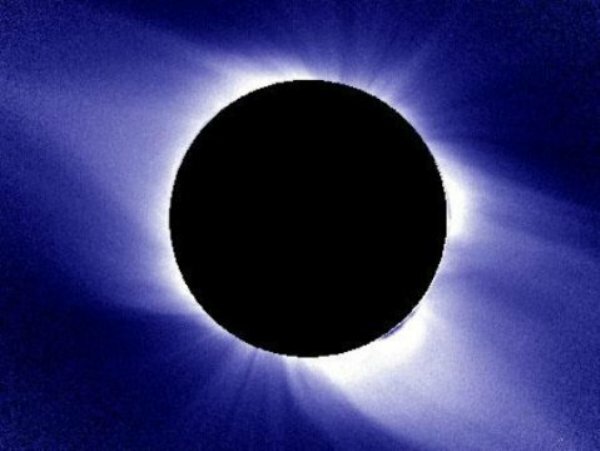 Black noted that during the eclipse the moon will align exactly with the sun’s surface and enable observations of the entire corona, including regions that are rarely detectable. “The moon is about as perfect an occulter as one can get,” she said. Obtaining observations from the ground will play a particularly important part in the experiments, she explained, because far more data can be transmitted than would be possible from space-based instruments. In addition to focusing ground-based instruments on the sun, scientists will also deploy aircraft to follow the eclipse, thereby increasing the amount of time they can make observations. An NCAR research team, for example, will use the NSF/NCAR Gulfstream-V research aircraft to take infrared measurements for about four minutes, helping scientists better understand the solar corona’s magnetism and thermal structure. Scientists at the Southwest Research Institute in Boulder, Colorado, will use visible and infrared telescopes on NASA’s twin WB-57 airplanes to enable a unique look at both the solar corona and Mercury for about eight minutes. The goals are to better understand the movement of energy through the corona and to learn more about the composition and properties of Mercury’s surface. During the eclipse, scientists will also study Earth’s outer atmosphere, the ionosphere, a region of the atmosphere containing particles that are charged by solar radiation. Disturbances in the ionosphere can affect radio waves. Because the eclipse blocks energy from the sun, scientists can study the ionosphere’s response to a sudden drop in solar radiation. For example, a Boston University research team will use off-the-shelf cellphone technology to construct a single-frequency GPS array of sensors to study the ionospheric effects of the eclipse. This project could lay the foundation for using consumer smartphones to help monitor the outer atmosphere for disturbances caused by solar storms. In another experiment, a Virginia Tech team will use a network of radio receivers and transmitters across the country to observe the ionosphere, while researchers at the University of Virginia and George Mason University will use transmitters broadcasting at low frequencies to probe various regions of the ionosphere. The Citizen Continental-America Telescopic Eclipse (CATE) Experiment by the National Solar Observatory, for example, will rely on volunteers from universities, high schools, informal education groups, and national labs for an eclipse “relay race.” Participants spaced along the path of totality will use identical telescopes and digital camera systems to capture high-quality images that will result in a dataset capturing the entire 93-minute eclipse across the country.